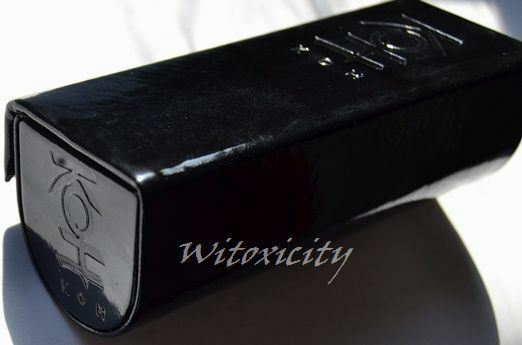 In its newsletter sent out last week, ELLIS FAAS has shone the spotlight on its Creamy Lips L105. ELLIS FAAS calls it a reddish-brown but to me, it looks copper/coral brown. I had already been planning a couple of autumn-related posts using the Creamy Lips L105 that I received from ELLIS FAAS a few weeks ago, so this newsletter certainly came at a good time. 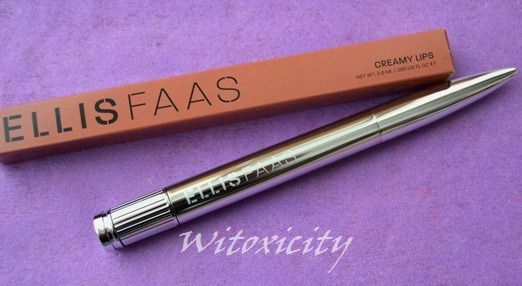 I wrote a whole review on the Creamy Lips almost two years ago (one of the first items I purchased from the ELLIS FAAS line - L106) and my opinion about it remains the same. 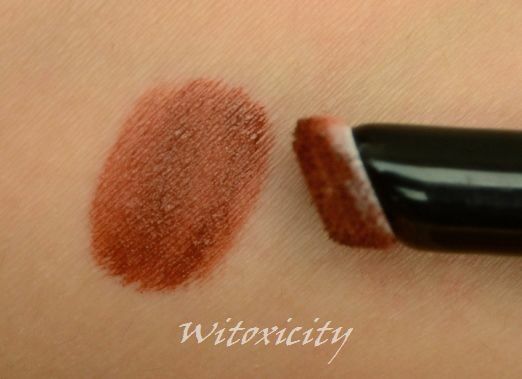 This liquid lip colour offers high coverage, is pigment-rich, very moisturising, melds with the lips, fairly longlasting and leaves a sheen on the lips. I still like to call it moisturising velvet. Seen here is L105 applied thickly. You can of course dab on lightly for just a hint of colour. 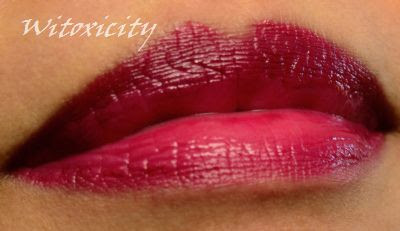 The Creamy Lips range retail for €25 / £22 / USD35 each. In the newsletter, there was also a discount code. 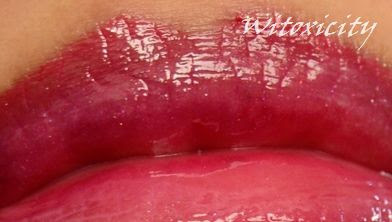 Use SNOWL105 for a 10% discount on your whole order (which includes the Creamy Lips L105). Be still my fluttering heart. 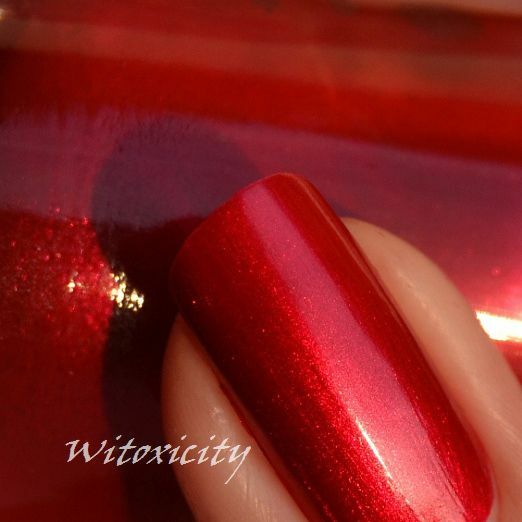 Calling this red polish gorgeous would be such an understatement (and it's not even a flakie polish!). 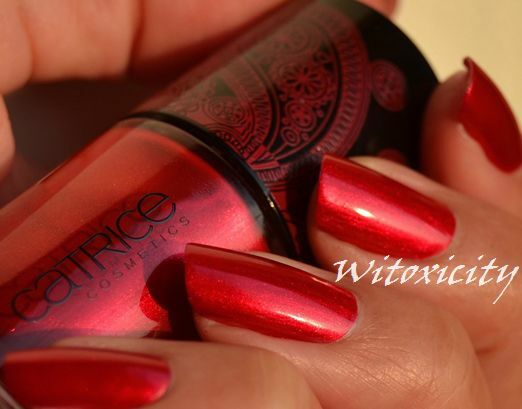 Looking Sunkissed by Catrice is a metallic polish with depth and character. It glows from within. Away from the sun, it looks like red satin ribbon. 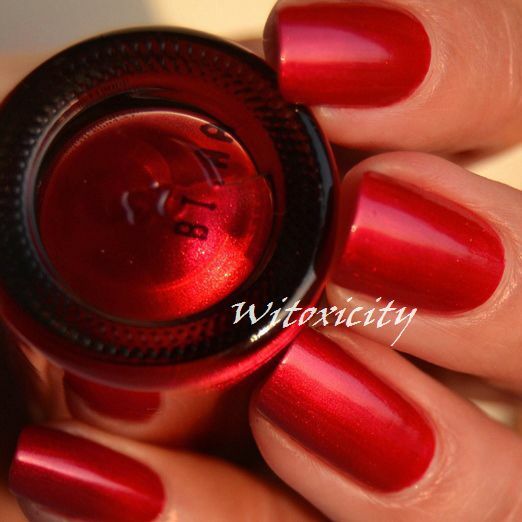 I have to say that it's even more awesome a red than Teeez Femme Fatale, for example, but I wouldn't be surprised if there are other similar reds by other brands. I have two coats on. 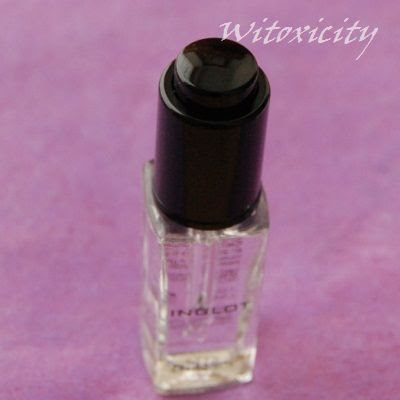 The formula was perfect and application with its broad brush was excellent. You would no doubt have noticed the pretty paisley print on the bottle cap. 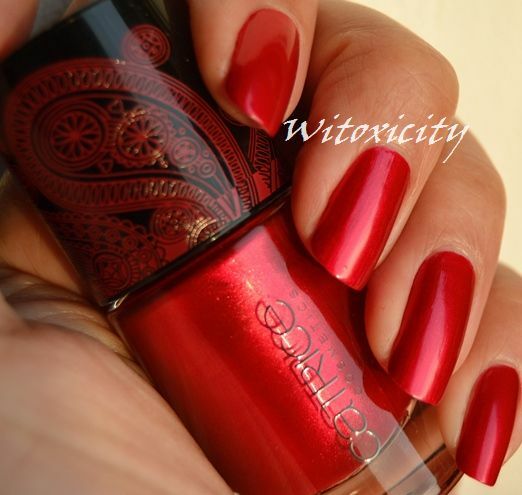 Ummm, can this bottle of polish get any prettier?! Looking Sunkissed was released some weeks ago by Catrice under the Limited Edition (gotta love hate that phrase - we all know it's a psychological trick, right?) Bohemia collection. I'm far from being done with this collection and Catrice has already released yet another collection called Big City Life and yes, it's limited edition. Catrice, you've got to slow down with your releases. It's driving us nuts! I actually swooped up all four polishes from this collection (not something I usually do). Looking Sunkissed here is probably the best-looking of the lot. I think. 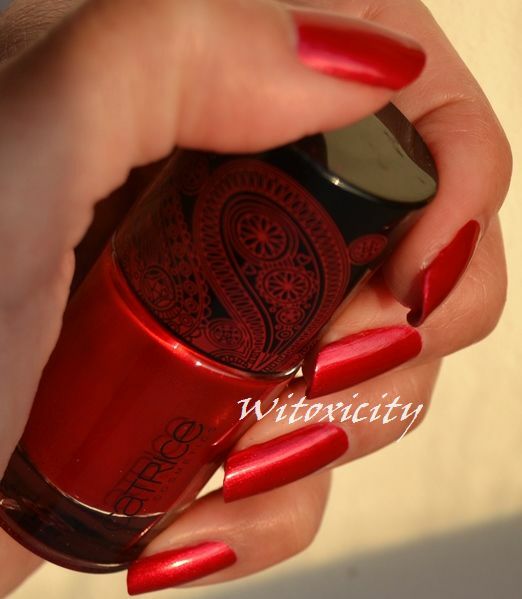 As you can see, it is a very photogenic polish too. 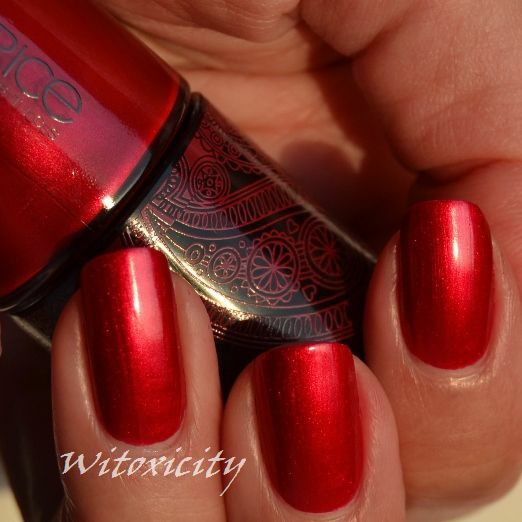 This giveaway wasn't in the original plan but KOH has kindly provided another set of the KOH Balance Winter Colours 2011 polishes. So, of course, someone needs to win this! The winner walks away with the entire set of six polishes that make up the KOH Balance Collection with a total retail value of almost €90. 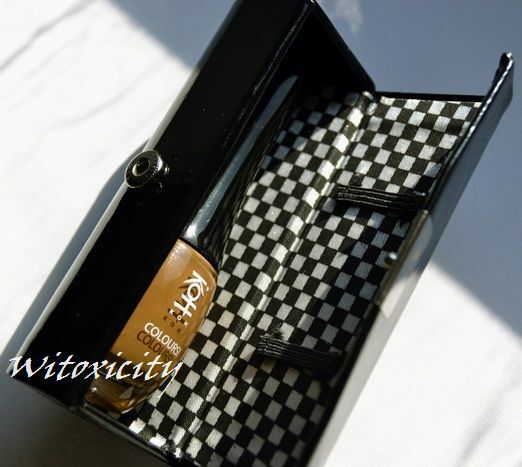 Each bottle would of course come in a KOH case which I talked about in the Eat Purely post. There will also be a cute mini KOH paper fan inside every case. Which is your favourite out of the six polishes in the KOH Balance Collection and why? 5. Comments from readers are always much appreciated. 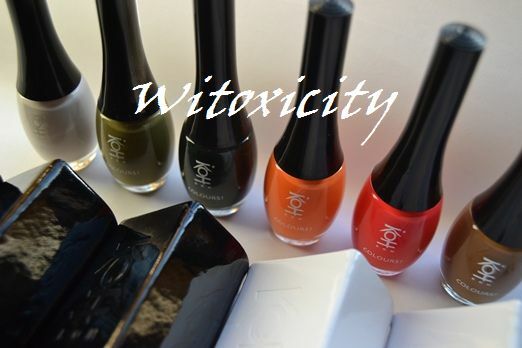 Readers who left comments on the posts featuring the six KOH Balance Collection polishes receive one extra point for every comment left there prior to the announcement of this giveaway, provided that they fill up the giveaway entry form. Note: To avoid confusion, please participate using the same name as the one used in the comments. 6. Optional: Feature this giveaway on your blog with the first image above - three extra points. 7. Optional: Tweet about this giveaway - one extra point. Note: Tastes differ. Do follow only if you like what you see. 9. Submit your entry by latest 11.59pm (Central European Time) on Friday, 11th November 2011. 10. The winner will be picked randomly. A product that makes it possible for other products to multi-task - that's always a good thing and that's what Duraline can do for eyeshadows. It's something similar to others on the market, like Eve Pearl's Shadow Mixer and Sealer. 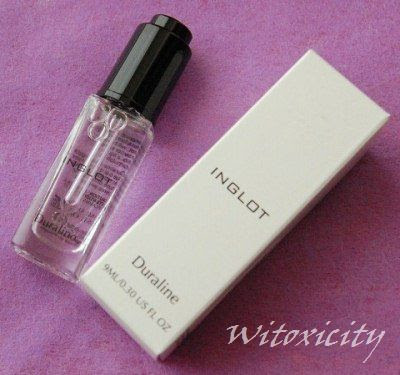 Duraline is a special transforming liquid that will turn any Inglot powder eyeshadow into a liquid formulation. Use one small drop of Duraline mixed with any pressed or loose eyeshadow. 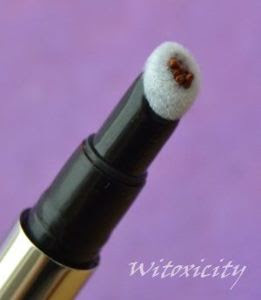 This transforms the eyeshadow into a concentrated fluid texture that can be used as a gel eyeshadow or liquid eye liner. Mixing Duraline with eyeshadow ensures that the colour will resist creasing, smudging or fading. Isododecane, Bis-vinyl Dimethicone/Dimethicone Copolymer, Capryl Glycol, Phenoxyethanol, Hexylene Glycol. It's a clear liquid, thicker than water. 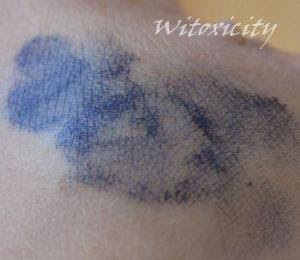 In the instructions, Inglot advises to dispense a drop of Duraline on the back of the hand, wet a brush with it, then blend into any pressed or loose eyeshadow and apply. 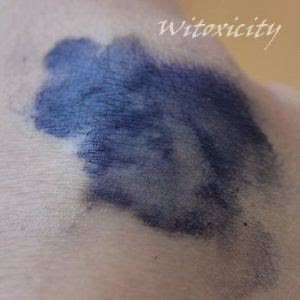 I do it slightly differently: a drop of Duraline on the back of the hand, pick up eyeshadow from pan with (dry) brush, then mix the eyeshadow with the Duraline on the hand and apply. 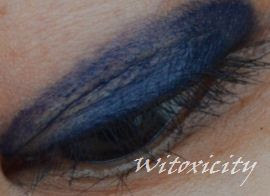 I do this as I prefer to keep my eyeshadows in the pan 'untainted'. 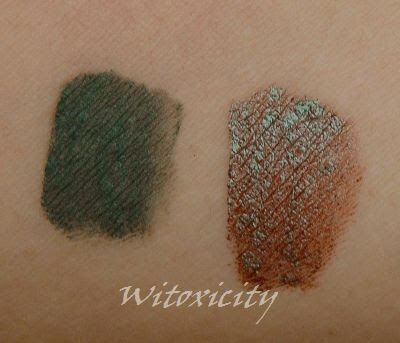 The possibilities are limitless, if you extend its use to beyond Inglot eyeshadows. I'm sure Duraline has been tried on eyeshadows from other brands too (well, there is actually no advice against that). I myself have tried Duraline with loose pigments from other brands only a couple of times but I don't think I will be venturing much further. Call me paranoid but I know nothing about how Duraline changes the chemical composition of any willy-nilly non-Inglot eyeshadow. 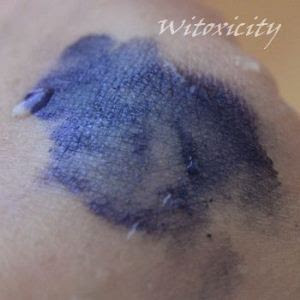 I mean, would the mixture be toxic for the skin? Perhaps it's not a big deal but I just thought I'd give my two cents' worth. If it doesn't matter to you, then there're certainly many possibilities to explore with Duraline! • Takes a while to dry, about three-four minutes. 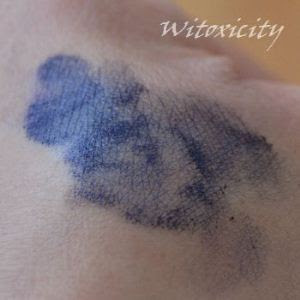 • Once absolutely dry, the eyeshadow stays put. 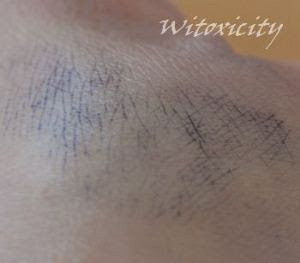 • When rubbed on hard, does not smudge but a teeny tiny bit does rub off on finger. 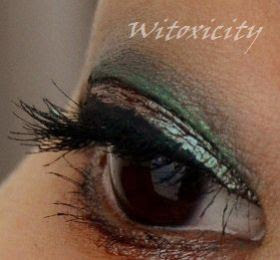 • As eyeshadow, not quite as crease-resistant on my lids as hoped. This is less of an issue as an eyeliner. It's not 100% crease-resistant, as you can see, but like I always say, I do have inward folding lids. It probably works better on some other ladies. 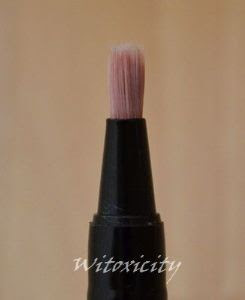 I like using it for converting eyeshadows to eyeliners. It works great. At €10, I think it's good value for money. I've used it many times since I bought it in May - one or two little drops each time - and the volume level has sunk only about 3mm. Here are two eye looks that I've done in the past. In both, I used Duraline for eyelining. The online shop of Inglot Netherlands will be open for business soon. 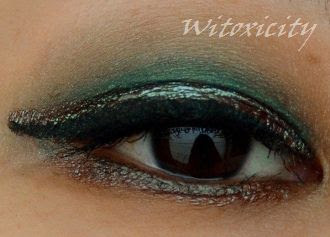 It's been a long time since I last used ELLIS FAAS Eye Light E305, that duochrome metallic turqoise-burgundy liquid eyeshadow (well, wasn't that a mouthful?!). The last time I used it was when I tried out two looks suggested by Ms Faas for the Winter Glow gift set. I think I overdosed on E305 back then. I anticipated some problems with clogging in the pen and decided to give the applicator brush a good wash. 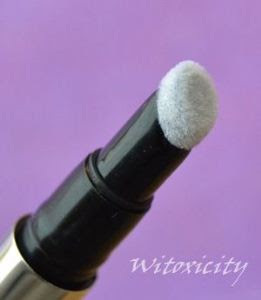 Applying the same method and using the same precautions as when washing makeup brushes, I gave the E305 brush applicator a good wash with water and cleanser. This was what the brush looked like after it dried - nice and clean. 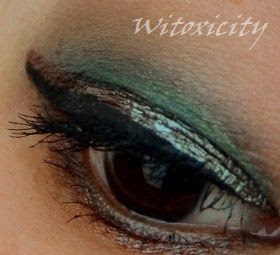 There was still a bit of solidified eyeshadow further inside that couldn't be washed out. I managed to extract that with a clean toothpick. With that done, I didn't experience any clogging problems with this pen. • Applied the petrol green of E204 on the lid with a brush, used finger to fade out the edges and add a hint of colour to the outer corner. • Used an eyeliner brush to draw Light E305 on the lid fold, wing-ed it. 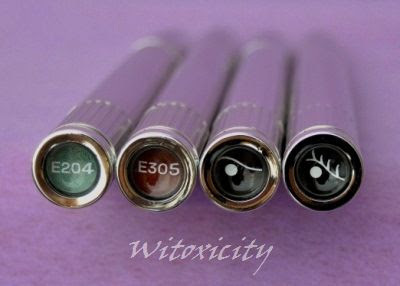 • Used an angled eyeliner brush to line upper lash line with Eyeliner E501, follow the wing of E305. 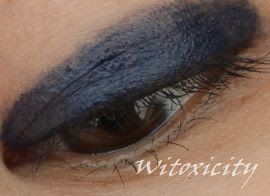 • Lined lower lash line with a bit of Light E305. • Applied two coats of Mascara E401. 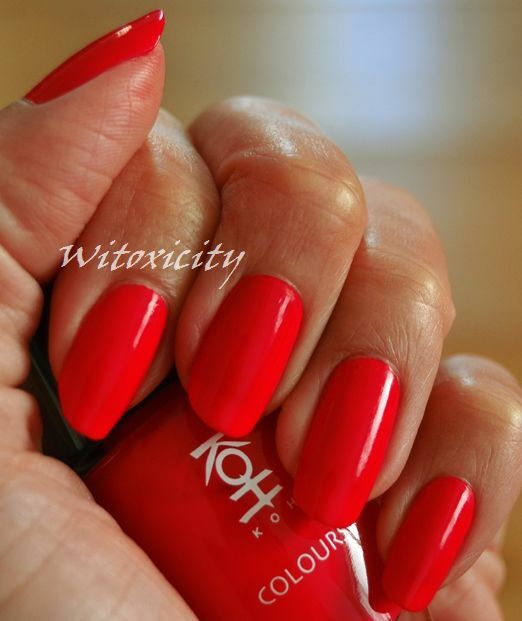 KOH Love Passionately is the fifth shade from the KOH Balance Winter Colours 2011 collection. Red may symbolise passion but Love Passionately isn't quite as amorous a red as what the name suggests. To me, it's a weeee-happy! 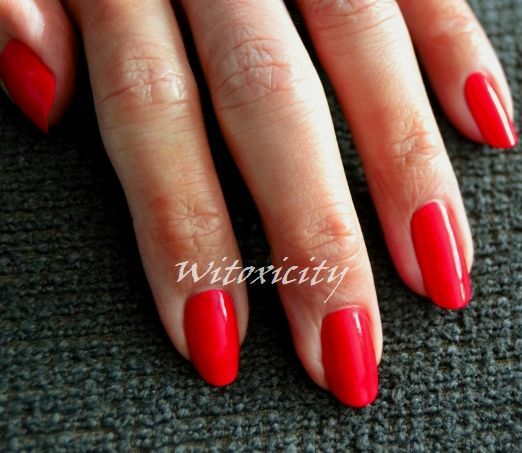 red, a kind of upbeat coral cherry red with a tiny bit of blue undertone. It's a crème and this polish applied just like how Rest Fully and Laugh Limitless (-ly?) did, i.e. nice and smooth. I applied two coats on all nails except this pinky, which has three. 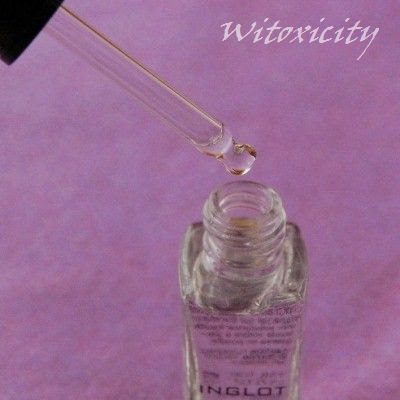 For most of us, Inglot must be the only Polish cosmetic brand we know, thanks to its retail presence in many countries. Of course, there exist other Polish cosmetic brands that have remained mainly local and which most of us have no easy access to. I was introduced to this brand, Virtual, by the lovely Paulina who, yes, lives in Poland. I won this lipgloss in a giveaway she held a while back and this lipgloss arrived very securely wrapped in an envelope and accompanied by a gorgeous scenic postcard. Thanks again, Paulina! 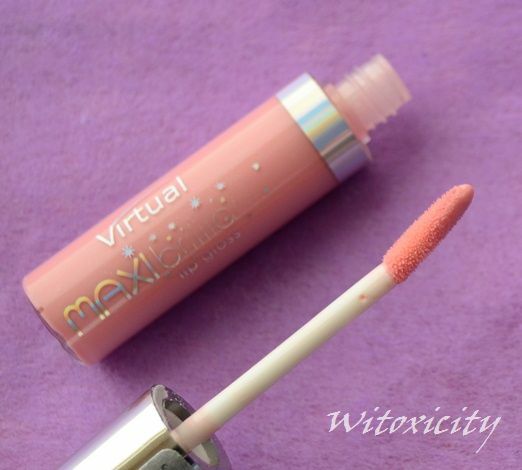 Lip gloss with gentle coverage, with the effect of spatial reflexes in diamond coating. 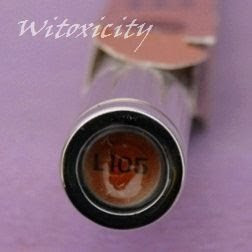 Apply for a layer of shiny lips, giving them maximum shine, causing the optical magnification. 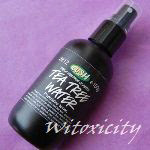 Moisturizes and nourishes the delicate skin, contains complex formula with vitamins A, E and F, and jojoba oil. According to the website, there are six shades in this range and the one I have is No. 12. It is a pale milky pink with bits of bling-bling shimmer. It has a pleasant, light fruity scent and it is only slightly sticky, which is good! The shine/gloss factor can't be missed. I unfortunately can't wear pale pinks alone on my lips - doesn't go with my skintone. However, it's nice to layer this Maxi Brilliant Lip Gloss over dark lipstick shades, for a different look or if I want to tone the dark shade down a few notches. 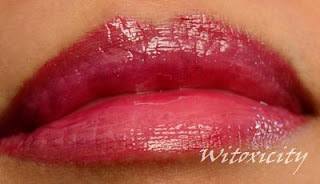 Seen here is Catrice Absolut Moisture Lipstick in 140 Burgundy. Sadly, this range of Absolut Moisture lipsticks is no longer available (at least, here in the Netherlands). 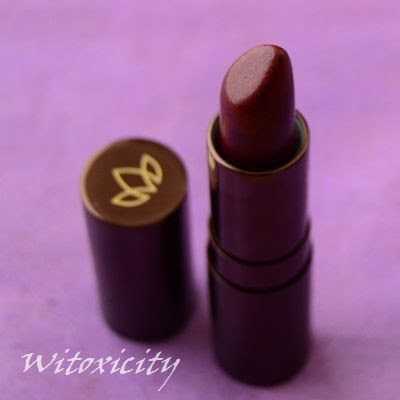 I had featured this lipstick in the pinup girl red shade called 070 Luxury Red in June last year. 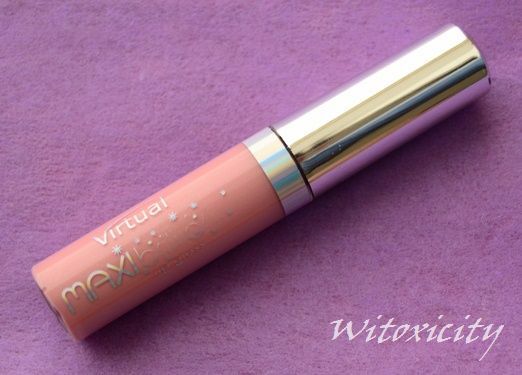 This is how it looks with Maxi Brilliant Lip Gloss No. 12 layered on top. You can probably just about make out the bits of brilliant shimmer on the lips. 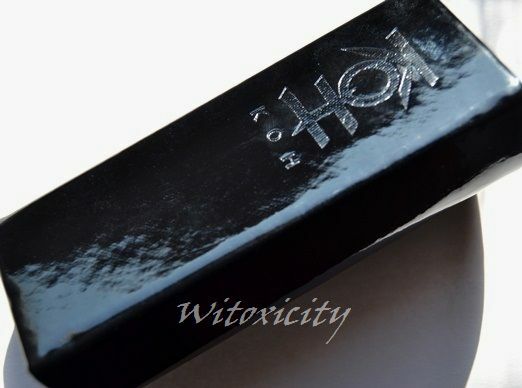 It is stated on the packaging that the lipgloss is produced by Joko Cosmetics, which has its own separate line of makeup.